♬Liner Notes♬: We're back from last week's Pickathon music festival, energized with another batch of great new music from Mike Krol, Kurt Vile, Diane Coffee, Foals, Blitzen Trapper and freakin' Man Or Astro-Man?!? Let's do this thang! Notes: "Krol has spent the last few years working on solo materials and playing in bands in both Los Angeles and Madison, Wisconsin, honing his garage rock chops one thick power chord at a time. His first two albums, 2011’s I Hate Jazz and 2013’s Trust Fund, backed up their smartass titles with collections of fun, infectious garage rock with an edge of pop that showed that the musician was smarter than he let on. 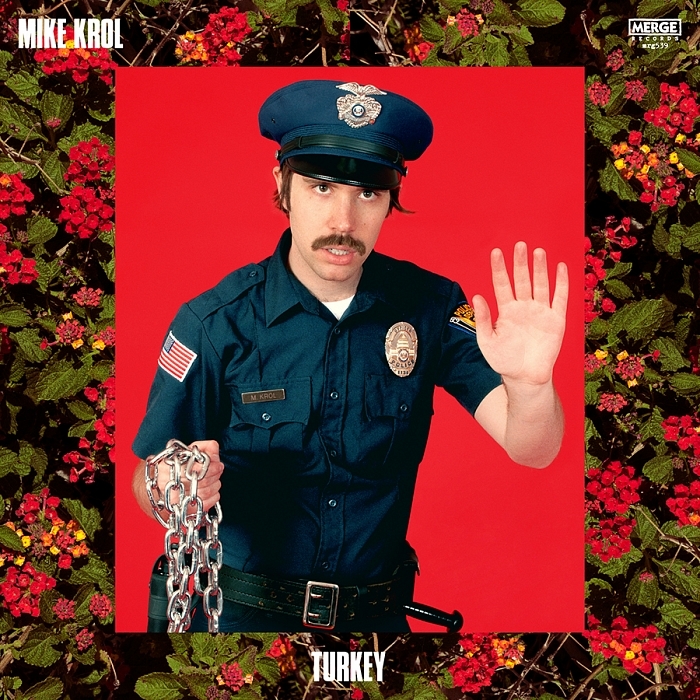 Ahead of the release of his latest album, his Merge debut Turkey, Krol quit his graphic design job and focused entirely on the record..."
Notes: "Philadelphia-based songwriter Kurt Vile...described his curiously punctuated LP as “all over the place” earlier this year, but lead single “Pretty Pimpin” is chock full of the acoustic guitar sighs and vocal shrugs that he’s made his bread and butter over the course of the last half decade. The album was recorded in various studios across the states, including in Los Angeles and Joshua Tree." Kurt Vile occupied the same sweet second song slot a couple years back on Episode054. Notes: "Born and raised in Minneapolis, Jim Bartell’... [spent] considerable time behind the mixing board at Pachyderm and his own Northpaw Studio... The collection of songs on Bartell’s debut album in 2013 and follow up E.P. in August 2015 are deliberate, mature, and cohesive." "The Way You'd Love Her"
Notes: "HEART, HER, ME, hers: scan the repetitive titles of these eight tracks and Mac DeMarco doesn’t really seem to be stretching the pop lexicon with his brisk follow-up to last year’s Salad Days. What he mines from that standard vocabulary, however, is golden... The Way You’d Love Her and Another One, roughly conventional tales of lost love and romantic yearning, are destabilised by half-melted guitars, the sense that behind these sweet and splendid songs, there’s somebody only just holding it together." We heard Mac Demarco last year on Episode105. Notes: "English tropical-prog five-piece Foals announced their fourth album What Went Down in June... second single, “Mountains At My Gates,” a fuzzed-out, frenetic journey driven by psychedelic guitar solos to a fever pitch. Yannis Philippakis wails like he’s ascended the highest peak and wants the whole world to hear his victory shout." Notes: "Between guitarist Charles Moothart and bassist Roland Cosio, Fuzz have enough face-smashing garage riffs to justify keeping their drummer Ty Segall – who just so happens to be one of the premier guitarists of the last few years – behind the microphone and drum kit. Fuzz began in 2011... The first thing that jumps out on “Pollinate”, one of two advance tracks released from the album, is not how dirty the riffs are (that’s a given here), or how tense its heady fire is (Segall’s voice has that vibe on lock): it’s how thunderous its low end is." Notes: "[Holy Esque] soon became one of Glasgow’s most talked-about bands. After supporting Wu Lyf on tour, the band had picked up momentum before entering the studio to record what would be the first of a string of singles before the 2013 Holy Esque EP. Further touring followed, as well as another pair of singles before the release of this year’s Submission EP." Notes: "Totally caffeinated and ready to take over the world, Shaun Fleming, a.k.a. Diane Coffee, is no stranger to showbiz. The California-bred Fleming started his career as a Disney voice actor, but shifted focus when he moved cross-country to New York and rose as the drummer for Foxygen... [Diane Coffee's solo music has been] theatrical, it’s expressive, it’s big, and his latest single “Mayflower” is no exception." Shaun Fleming aka Diane Coffee's making his first real appearance on PUTV after his guest slot on 'RTJ2' that we played last December on the awesome Episode139. Notes: "Lochness Mobsters originally formed in Lake Charles, LA back in 2008 but they recently moved to Austin. The trio has a new album coming out called War Tuna... a revved-up gumbo of punk and surf-rock, anchored by the lo-fi party of “Igloo’s Icepick.”... they would have made Lux Interior proud." Notes: "Philly’s buzzing psychgazers The Spirit Of The Beehive recently released their new EP You Are Arrived (But You’ve Been Cheated). They’re currently out on the road touring with Amanda X... While You Are Arrived is crammed with musical ideas to the point of claustrophobia, it all makes sense. Filled with found sound samples, blasts of distorted guitar, sweet, warbly melodic rushes, and full on shoegaze rockers, the EP brings to mind The Flaming Lips’ early classic, Oh My Gawd!! !, and the Swirlies’ Blonder Tongue Audio Baton." "Drowsy/Too Long to Say Good Night"
Notes: "Did you know that Sweden is the world’s largest exporter of pop music in relation to their GDP?... Sweden has Jay-Jay Johanson, and he seems to have a mastery over everything that completely eludes the American pop music market... Opium is his 10th album, and his discography has seen a shift from trip-hop to a more electroclash sound, all the while retaining a soft, lilting, ‘20s-style voice that is at once dreamy and hopeless. Sometimes (particularly on opener “Drowsy/Too Young to Say Good Night”) he sounds like a Vaudeville stage performer with a painted-on Chaplin mustache." Notes: "Dengue Dengue Dengue! is an audiovisual duo born in mid-2010 in Lima, Peru... In 2012 they released their debut album “La Alianza Profana” (or “The Unholy Alliance”) and the video for the single “Simiolo”." The album's gettin gnew life with its vinyl release. Notes: "An album that [KCRW] has been championing on-air, Mbongwana Star's new record features a Congolese seven-piece band that marries traditional African rhythms with post-punk. "Masobélé" is from their full-length debut, From Kinshasa." Kinshasa is the name of their hometown in the Democratic Republic of the Congo. Notes: "After 12 years of near-silence, sci-fi rockers Man or Astro-Man? [returned in 2013] with...Defcon…5…4…3…2…1, the 12-track effort was recorded with Steve Albini in Chicago and Daniel Farris (Polyphonic Spree, Amy Ray) in Birmingham, AL. According to a press release, the album “brings the band’s unique powerful style of Science Friction back to greater humanity in supreme form” and showcases them “being as inventive and propulsive as ever”." Notes: "Reliable Portland alt-country rockers Blitzen Trapper have released an album every year-and-a-half or so like clockwork and, just on time, they’ve announced that their next record, called All Across This Land, will be out in October. In an interview from a few months ago, frontman Eric Earley said that the new one would be “a little more of a live aggressive record. It’s probably the truest-sounding to our live show” and a “return to a classic rock sort of thing.” They’ve shared the first single, “Lonesome Angel,” which tracks along those lines — nothing groundbreaking, but very pleasant nonetheless." PDX boys Blitzen Trapper are going for their fourth spin to wrap up PUTV170! Listen to new @blackalicious_ track "Blacka"
Big media companies' stocks have lost almost $50 billion in market value in less than 2 days. #Pickathon2015 has so many bands that we've played on @PumpUpThaVolume, it's like a PUTV Fest!